We recently had an inside peak at world renowned chef, Eric Ripert’s show kitchen shot for his first solo TV series on PBS stations, AVEC ERIC. Ripert’s kitchen plays an important part in his creative process and is truly a reflection of his holistic approach to food and lifestyle. 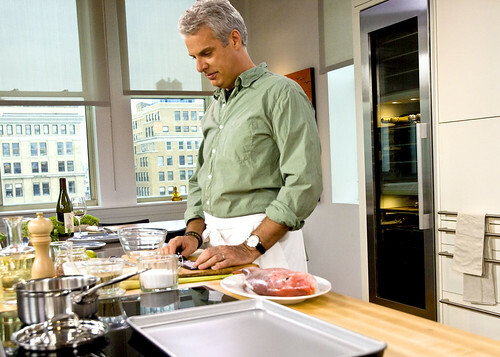 In each episode Chef Ripert guides viewers through a culinary journey to where he finds his sources of inspiration. Shot on location around the world, each show returns to his home kitchen where Ripert translates the inspiration gained from his travels into dishes that home cooks could make themselves – all in stunning surroundings and with high performance tools of the trade. The white laminate cabinetry selected for the show provides a clean, modern look, maximum storage and maintains Ripert’s vision for an eco-friendly space. The main island and seating area extends the social and entertainment aspects of the kitchen. Open cabinets and shelving areas provide effortless access to seasonings and tools. Poggenpohl kitchen designers worked closely with Ripert to integrate a countertop where the butcher block surrounds and is flush with the cooktop surface, for a more streamlined cooking process. Ripert’s kitchen includes a Miele convection oven, speed oven, warming drawer, dishwashers and induction cooktop. In addition to these exceptional elements, the kitchen also boasts an Independence Series refrigerator and wine storage unit. The refrigeration and wine storage come equipped with RemoteVision™ WiFi technology that monitors the appliances so Miele can alert Ripert if something goes wrong (say a door left open) while he’s on location. 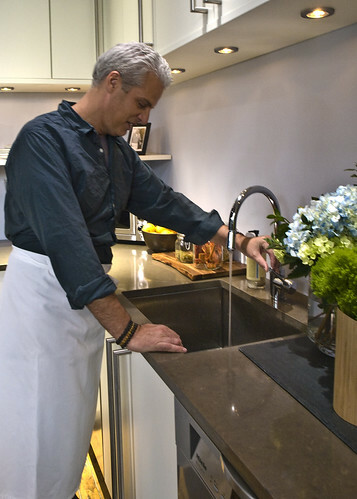 Ripert’s sink of choice is the PRECISION™ 16” R10 Single Bowl – a sophisticated, handcrafted sink made by BLANCO’s exclusive STEELART® division. The 10mm rounded corner radius is flawlessly smooth with an uncompromised attention to detail. A unique satin polished finish with exacting drain grooves complete the beautiful design for easy-to-clean functionality. The KONTROLE faucet sleekly hides a pull-down spray in its elegant pillar design. 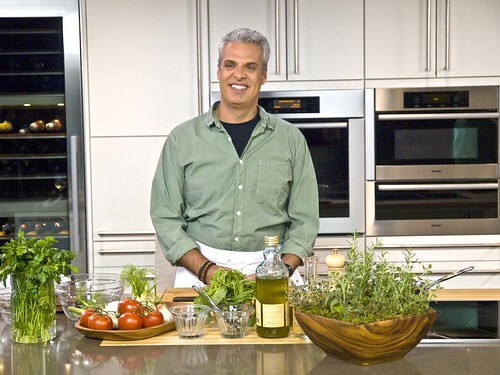 Eric Ripert is best known as the chef of Le Bernardin restaurant in New York City and fan favorite guest judge on Bravo’s “Top Chef.” For Avec Eric, he stars in his own 10-episode series airing nationally now on PBS stations (check local listings). Thanks Lori! There's nothing like a French man who cooks! Ooh la la! A sleek and simple kitchen seems the perfect counterpoint to that view! Love how the butcher block countertop warms things up just enough.